With seduction and heartbreak in her past, it's understandable that heiress Anne Adair would want to protect others from experiencing what happened to her. Along with her friends in the Sisterhood for the Ruination of Rogues, she sets out to warn young women away from the rakes who would take their innocence and ruin their reputations. Their first target, Lord Rutledge, was found embracing Anne's dear friend Fanny during a ball and refuses to wed her. When Anne sets out to ruin him in return, her actions bring her to the attention of the newly arrived Duke of Kilmartin, a friend of Rutledge who insists the man is innocent of the charges leveled against him. Anne is reluctantly attracted to the man and, as she spends time with him becomes smitten but with Simon telling her one thing and her friends, something else, who can she believe? Simon Sedgwick has returned to London after many years to accept his position as the new Duke of Kilmartin following his grandfather's death. His last visit there did not end well. He had journeyed to London to ask the grandfather he had never met for help for his mother and sisters following his father's death. Wrongly accused of something he did not do, Simon was cast off by his grandfather at the urging of his grandfather's good friend, the Duke of Rowan, an action that had dire consequences for Simon's mother. Simon returned to Scotland where, over the next several years, he built a company and a fortune from nothing but he never forgot what Rowan did and the need for vengeance still burns within him. When he discovers that the beautiful woman maligning his friend, Rutledge is none other than the granddaughter of the Duke of Rowan, he seizes the perfect opportunity to both help his friend as well as finally avenging his mother's death. But, of course, his plans don't unfold as he envisions and, soon, he's pursuing Anne for reasons far removed from revenge. 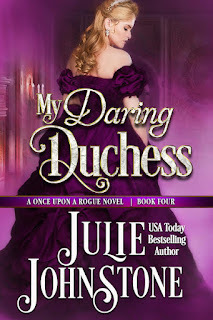 Let me start by saying that I am a huge fan of Julie Johnstone's Medieval Scottish romances, as you already know if you have read any of my reviews. They are intensely emotional, finely crafted, action-packed books, and pull me in to such a degree that I lose track of everything except the characters and their story. This is a different type of story. First, it's set in London rather than Scotland, during the Regency, and while the theme is revenge, the story itself is much lighter in tone. It's part of Johnstone's Once Upon a Rogue series and though characters from previous books in the series make appearances, this novella can easily be read as a standalone. 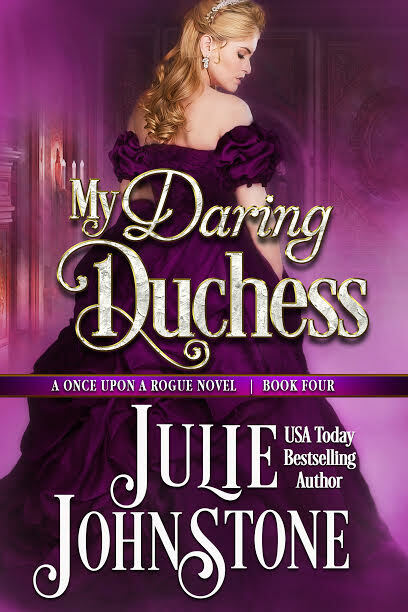 Maybe it's because I'm used to Johnstone's outstanding writing in the Medieval books previously mentioned or maybe it's the shorter novella length but My Daring Duchess didn't have the emotional punch I was hoping for. Don't get me wrong, I liked it, but I didn't love it. I would have liked the characters to be more fully explored. I know that's more difficult to accomplish in a novella but Anne, in particular, had my head spinning with her frequent personality flips and snippy accusations. I think I might have liked her better if her character hadn't evolved at whiplash speed and I was given more of an opportunity to understand her. Also, for me, her quickly advancing relationship with Simon would have been more believable. Simon's character was more fully explored which, perhaps, is why I felt more of a connection with him. I especially enjoyed his sisters and wonder if we might see them again in a future story. This story has good bones but it felt rushed to me and I was hoping for more depth though I'm sure there will be many readers who will enjoy it exactly as it is. If you're looking for a quick, light read, or are already a fan of Johnstone's Once Upon a Rogue series, this novella may be just right for you. Readers, have you ever hatched a plan of revenge? One randomly chosen person who leaves a comment on today's post will receive their choice of one of the first three books in the Once Upon a Rogue series (in ebook format). I've never actually hatched a plan for revenge but there was a time I had visions of it.:). Never would have acted on it. Where would it have gotten me. I may have thought about it a time or two in my younger years but I never would have gone through with it. I may have thought about it but never followed through lol. I'm more likely to kill someone with kindness or just cut them out of my life rather than to exact revenge. I have never plotted or followed through on revenge. But, a small group of my friends did seek revenge on my behalf. I was not there to see the results, but I did hear about them. I was not sure whether to thank them or not. I have never planned for revenge. I have told a few people off, but it really didn't make me feel better. I figure revenge would have an even more unsatisfactory feel to it. I figure rotten people will eventually get what is coming to them. I just need to sit back and wait. I've never plotted revenge against someone.